The Ashley Stewart Credit Card provides an array of discounts and savings at all Ashley Stewart retailers and the process of applying could not be any easier. By completing a simple 10-minute web-application, you too can become an Ashley Stewart cardholder. If approved for the card, a sign-up bonus will be implemented giving you 20% off of your first purchase. 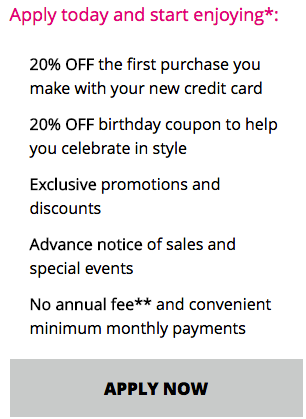 You will also receive 20% off on your birthday as well as advanced notice on special events and sales. There is no annual fee for the card however the annual percentage rate for purchases is extremely high at 25.24% (APR is subject to change). All in all, the card is average at best and should really only appeal to individuals that can take advantage of the special discounts and promotions. If you’re interested in applying, scroll down for a detailed look at the online application procedure. Step 1- Start by finding your way over to the Ashley Stewart Credit Card summary page which describes the benefits of applying for this credit option. You can access the online application form from here by selecting Apply Now. Step 2- Now that you have the application accessed, begin providing your personal details in each of the fields highlighted with a red asterisk. Here, you must give your First Name, Last Name, Date of Birth, Social Security Number, Email, and Home Phone number. Step 3- Type in your street Address 1, City, and Postal Code. Just beside that, use the drop-down menu to specify your State. Step 4- Scroll down until you reach the window dedicated to your income details. You’ll simply need to provide your total Annual Income in the empty field. 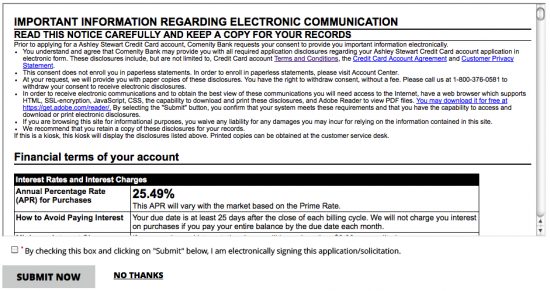 Step 5- Next, select Yes or No to let Comenity Bank know if you’d like to add an authorized buyer to your account. Note that an authorized buyer is someone who is allowed to make purchases with the card. Step 6- At this point, all of the requisite information has been provided and your card request is ready to be submitted. We recommend that before proceeding, you review the card’s terms and conditions to ensure that you agree with the pricing information described within the document. If you are in compliance with the terms, check the small box found just below the terms window. Finally, click the Submit Now button to have your application sent in to Comenity Bank for review. Thank you for choosing Card Reviews to assist you in this application process. We hope that this tutorial was helpful to you and we wish you the very best in all of your future banking endeavours. Take care!